So now I am thinking about Christmas and getting the house ready to 'sparkle' for the season. Here are a few of my new favourite 'sparkling' finds that I will be using to decorate my home this year. You can never have too many glass votives to use any time of the year, but they are essential at Christmas. 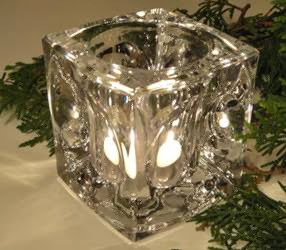 This chunky Ice Cube votive is stunning. It is oversized - 4 inches square - with a modern feel. Five lined up on the mantle would create a simple yet beautiful arrangement. The opening is large enough that it can hold flowers, or even condiments on a party buffet table. One is not enough that's for sure. I love acorns. ( Maybe it is because I live in Oakville and have a majestic oak tree on my front lawn.) 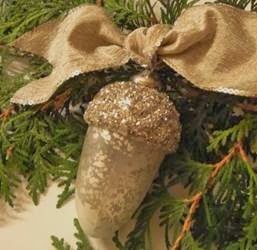 I have collected many different types of acorns and I am always attracted to acorn Christmas ornaments. I was so excited when I found these lovely decorations on my travels. 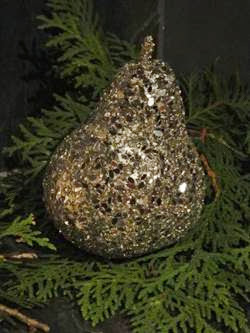 Made of glass with a mottled mercury finish, these acorns have pretty beaded glitter on the cap. I love the soft champagne finish with just a hint of sparkle. A soft gold ribbon with silver sequin edges adds the perfect finishing touch. And great news - all of these sparkling finds will be available for sale at my upcoming event. Click here for details. I hope to see you there!